Help your Mother around the house with a cute cleaning craft you will create as we listen to stories in Honor of Mothers. energy centers in the body. Come learn how its calming effects can help depression, anxiety, muscle tension, pain and stress. "Make a wish upon a star, catch some sparkling tales from near and far," Send yourself into orbit by creating a craft that is out of this world.... Count down to a movie, which will leave you feeling groovy." Celebrate an out of the world popular author Mo Willems and his hilarious book characters Pidgeon, Gerald the elephant and Piggie. Learn to draw the Pidgeon, hear his adventures and enjoy fun Piggie stories for all. "Discover the 'woman' behind the funny Geronimo Stilton book series! Enjoy a hilarious day exploring this famous mouse, born in Italy! Let's have fun with anothr series of books that are popular with children. Discover Franklin the Turtle while hearing his stories, seeing films making turtle crafts and some turtle activities. WIMP? "Weakly Interacting Massive Particles?" NO, this is NOT an "Astronomy" Lesson! Now, don't wimp out... Come and have a few laughs, as we explore Jeff Kinney's stick figure characters from his best selling "Diary of a Wimpy Kid" series !!! Fancy Nancy loves to wear fancy clothes, have fancy events and use fancy words for simple thing. Join us for some fun with with this popular series of books featuring Fancy Nancy and her antics. Meet Fly Guy and his human boy owner. Join them on the many adventures they have together when Fly Guy gets into trouble. Join us for an outer space experience as we hear some fun stories as aliens from the skies visit earth and even a library as a young man tries to return his books to the library. We will hear stories, see film and even make an alien craft. During a midnight meteor shower, something mysterious falls from the sky toward Earth--- but it's not a shooting star. Two curious kids venture into the forest to investigateand find themselves mixed up with a family of visitors from another planet! Pursued by a crazy space scientist, they must risk everythig to rescue the aliens and get them back to their spaceship-- before it's too late! Don't iss this action-packed alien adventure using science experiments for special effects. It's an out of this wrold experience at the Clara Barton Library. 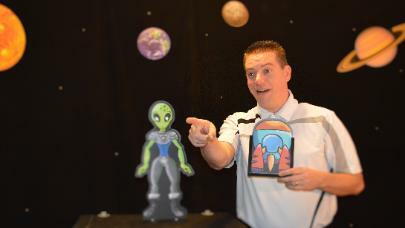 Get ready to Blast off with Magician Steve Woyce for "The Out of this World Magic Show" this summer. Help Steve make the Moon disappear, meet a forgetful librarian from a distant planet, and help Saturn Sam blast into outer space! Packed with tons of audience participation.